When it comes to best video editing software, VEGAS Movie Studio is among the best video editing software for quite a long time. It is aimed to provide capabilities to both novice and expert video creators. Its standard version, VEGAS Movie Studio is priced at $49.95 which is aimed at amateur moviemakers who require a simple and way to get started assembling, editing and cutting their footage. The good news is that even with its basic level, which means the program features are only in Simple mode, is still a very powerful version. 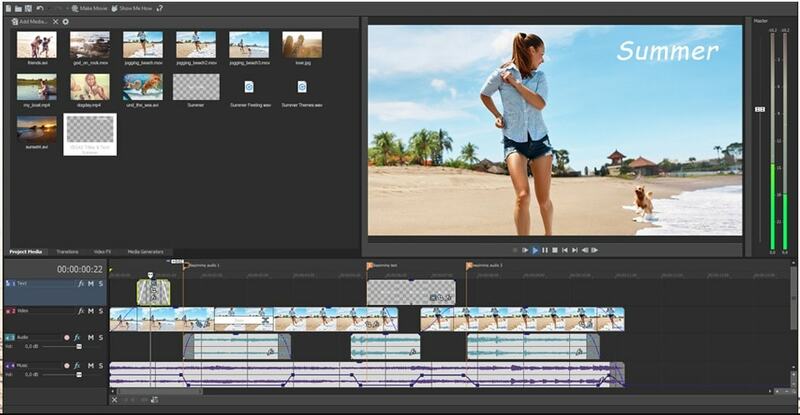 Using this software, you can customize the videos with preset text animations, add rolling credits and add transitions which have built-in dissolves and wipes. It lets you experiment with various special effects so that you get the best product as per your requirement. Its touch-enabled interface allows you to work from new 2-in1 laptops way too easily than its competitors do. While there is no change in the layout, these touch-screen-enabled buttons are comparatively large, and it makes it easier to grab any clips and move it around or apply various transitions and effects. This tool also allows you to customize soundtracks to get rid of noise, apply effects and use the track envelops in order to control volume and panning, or in case, record and edit live audio. Initially, VEGAS Movie Studio looks quite straightforward. But on getting deeper with this software, the user witness that it has crowded interface which will take a considerable amount of time to get used to with this software. Its performance while piecing together the test videos, a quick text intro, and transitions was considerably slower than its competitors’. Having said that, the finished product was not unusable. This application’s Show Me How feature is an interactive and simple tutorial which has borrowed some animated movies from its competitor, Adobe Premiere Elements. It also features two instructional videos, along with a Help button which can easily provide answers to newbies’ questions. It has numerous video special effects which let you add a variety of cinematic looks to your movie. The Auto Ripple tools is quite a brilliant tool for one-step insertion of various still images in between the videos. It also has another great tool for trimming the beginning and the end of clips, quickly. VEGAS Movie Studio 13 provides a decent experience with various effects and transitions. The storyboard view along with a template-based quick video feature could have been helpful. But even with its fine qualities, it leaves the user dissatisfied with its unappealing interface and lack of common novice-friendly features. With this, we end our review of VEGAS Movie Studio 13. In case you give this software a try, then do let us know about your experience. Also, leave your views and suggestions in the comment section below.